This paper introduces the concept of material ecology and explains the pedagogical approach that is embedded in the notion of environmental awareness by applying these methods to examples from contemporary art production and Yu Jian‘s thing poetry. Material ecology is a method of cultural analysis that opens up new perspectives on the relationship between human and nonhuman agents, ecosystems in particular, and on a planetary level. This new outlook is meant to engender a consensual set of environmental values that can transcend national borders. As a concept, environmental awareness applies to efforts by official or unofficial agents to change behavioral patterns that can harm the environment. This is done by demonstrating the consequences of said actions. The two approaches are at the core of the quest for a global polity that can support and integrate different communities in their various endeavors to implement rules and incentives for sustainable ways of living based on environmental justice. These must be widely agreed upon in order to commit all social levels, be it individuals, local communities, or transnational stakeholders. Since cultural representations fulfill a seminal role in changing world-views, I will discuss a selection of Chinese literary and art-works which serve as examples of this new perspective on things in material ecology. Highlighting the transformation of landscapes through globalized, unsustainable patterns of urbanization, agri-industrial production, electric power generation, resource extraction and waste disposal, the paper will first explore how nonhuman agency needs to be reimagined, perceived, researched and taught as well as aesthetically represented and narrated in the wake of this transition. In a second step, it will introduce Kunming poet Yu Jian’s thing poetry. I will argue that the poet aims at the cultivation of an aesthetic sensibility that can overcome the modern world’s obsession with façades, masks, and surfaces in general—be they composed of words or images. Subverting the regimes of data and information acquisition by means of a kind of haptic epistemology, Yu Jian’s creative bricolage of Anglo-American nature writing, European modernist realism, Chinese Taoist animism, and traditional shanshui, or landscape art does not only promote environmental awareness, but moreover transcends linguistic and visual modes of communication. Hence, his poetry brings to the fore humanity’s material embeddedness and protests against the materialist annihilation of nonhuman worlds and things. 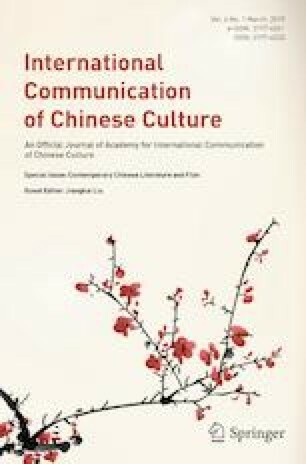 I am indebted to Beijing Normal University’s invitation to participate in their 9th Annual Meeting of the Academy for International Communication of Chinese Culture (Dec. 2018), where I could present the preliminary results of this research to an audience of leading Chinese and foreign experts. The reading paper on material ecology and other materials I drafted for our MOOC ‘Asian Environmental Humanities: Landscapes in Transition’ determined the direction of literary analysis I propose in this paper. Freiburg University’s Institute of Advanced Studies not only acted as a welcoming and most supportive host during the 2017 Spring term, they also allocated financial means for my journey to Kunming, where I could discuss my ideas and findings with Yu Jian. Stephen West generously shared his scholarship on Song literature by answering my questions on the Song poet’s conundrum. The reviewers for ICCC offered helpful advice for revisions. Last but not least, I thank the students of my UZH Fall 2017 MA seminar on Yu Jian’s poetry for their inspiring questions, comments and diverse ideas on how to translate it, and my UZH colleagues, especially Jessica Imbach and Justyna Jaguścik for taking the time to read my draft and offering insightful criticism. Beach, Sophie. 2009. Song Dong: Waste Not. China Digital Times. https://chinadigitaltimes.net/2009/08/song-dong-waste-not/. Accessed 12 Jan 2017. Ellen MacArthur Foundation. 2017. What is a Circular Economy?. https://www.ellenmacarthurfoundation.org/circular-economy/concept. Accessed 19 Jan 2019. Grondin, Matt. 2015. When You Throw Something Away, There Really Is No ‘Away’ | Ecomaine. Recyclopedia (blog), https://www.ecomaine.org/when-you-throw-something-away-there-really-is-no-away/. Accessed 19 Jan 2019. Herzog, Samuel. 2016. Als Elefant im Porzellanladen. Neue Zürcher Zeitung, https://www.nzz.ch/feuilleton/als-elefant-im-porzellanladen-1.18697626. Accessed 19 Feb 2016. Jensen-Cormier, Stephanie. 2016. Wang Yong Chen: The Clark Kent of China. In: International Rivers. People-Water-Life. https://www.internationalrivers.org/blogs/435/wang-yong-chen-the-clark-kent-of-china. Accessed 19 Jan 2019. Lu, Ran 陆冉. Cao Yuxi de “Qianli jiangshan guzhang tu” tixing women jinnian de wumai hai zai lu shang曹雨西的“千里江山故障图”提醒我们今年的雾霾还在路上(Cao Yuxi’s “Malfunction Scroll One Thousand Li of Mountains and Rivers” Reminds Us that this Year‘s Smog Is Still Lingering in the Streets). http://thecreatorsproject.vice.cn/read/Cao-Yuxi-the-vast-land. Accessed 23 Oct 2017. Research Group for China Modernization Strategies. 2007. China Modernization Report 2007: A Study on Ecological Modernization. Modernization Study. http://en.modernization.ac.cn/document.action?docid=28336. Accessed 19 Jan 2019. Riemenschnitter, Andrea, David Chiavacci, Dorothea Lüddeckens, Angelika Malinar, Nicholas Martin, Raji Steineck, Yue Zhuang, Kiu-wai Chu et al. 2018. Asian Environmental Humanities: Landscapes in Transition. MOOC. Coursera. https://www.coursera.org/learn/asian-environmental-humanities. Wang, Yongchen. 2006. Wang Yongchen online. Environmentalist with a dream. Friends of Nature. http://www.facetofacemedia.ca/files/WANG%20YONGCHEN%20ENVIRONMENTALIST%20WITH%20A%20DREAM.pdf.